You’ve seen lots of pictures from Jordann’s wedding already on the blog. But sometimes I feel like I still haven’t seen them all! We have soooooo many from that day. And still a few projects left to tell you about. 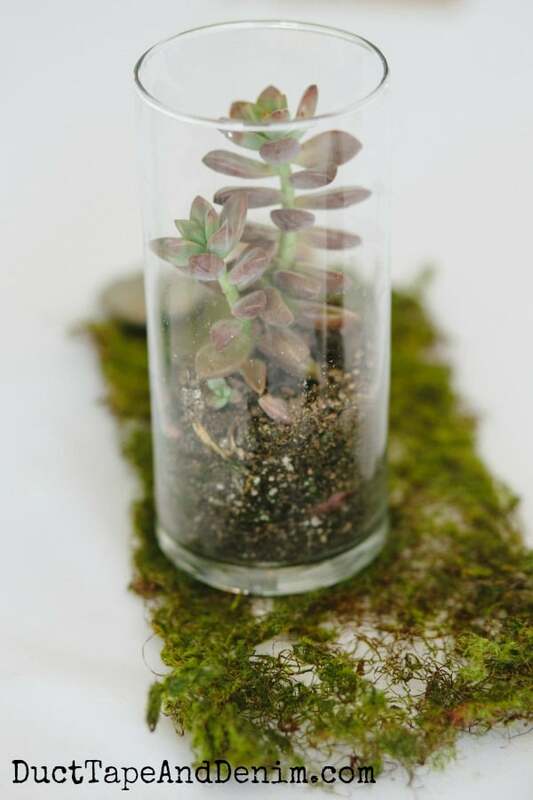 Today we’re sharing our DIY wedding centerpieces with succulents. We had a few clear hurricane vases but we were able to borrow most of them from the groom’s family — saved from another daughter’s wedding! 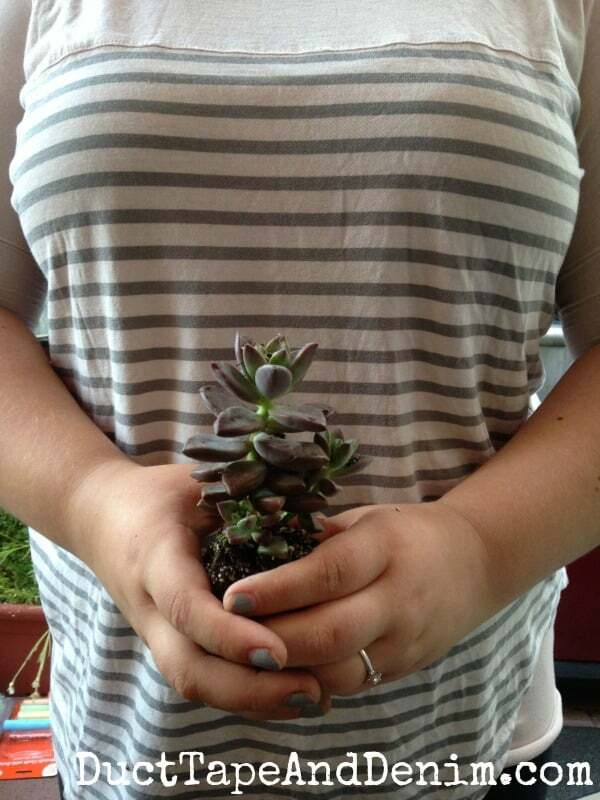 Then we bought LOTS of succulents from a vendor at Treasure Island Flea. She’s always there and has great prices that get cheaper the more you buy! 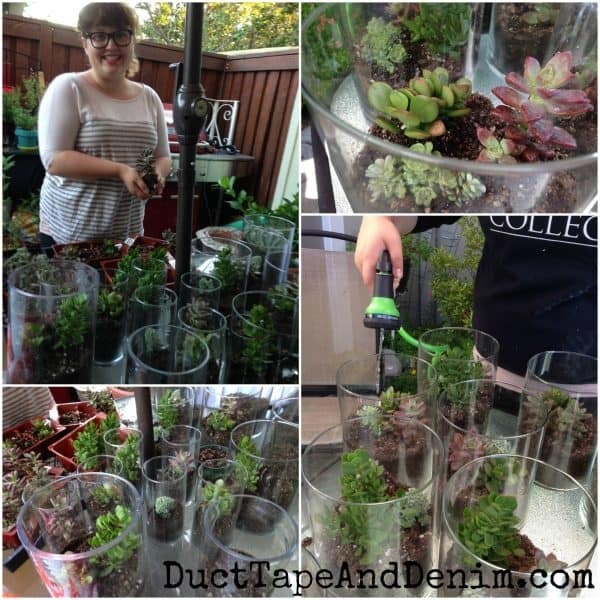 Each vase was filled about a third of the way with potting soil. I would usually add some gravel first but we knew these were temporary so didn’t bother with that step. The larger vases got 3 small succulents, smaller vases only got one. We watered them very carefully since there are no holes in the bottom of the vases. , and then we scattered some rocks around to tie everything together. The girls’ bouquets were also used on the head table. We also made sure each table had a little package of tissues! We knew there were going to be some tears. Jordann illustrated the chalkboards (found at Dollar Tree) with a chalk pen. Each one was completely unique. Of course, one of them HAD to have a bicycle and chain on it! We have a mountain-bike-loving family! We were lucky enough to find a whole box of vintage bottles at one time at a barn sale up in Chico. And you’ll see one of the vintage crown canning jars in the photo below that my other daughter brought back from Canada! 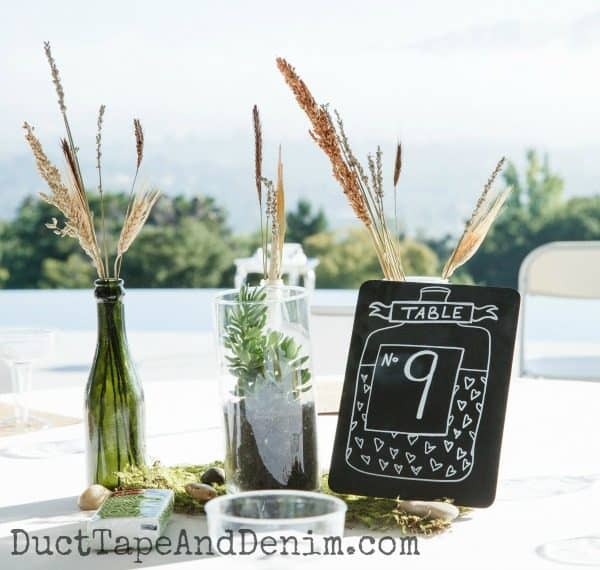 The dried grasses were perfect against the backdrop of Mt. Diablo! 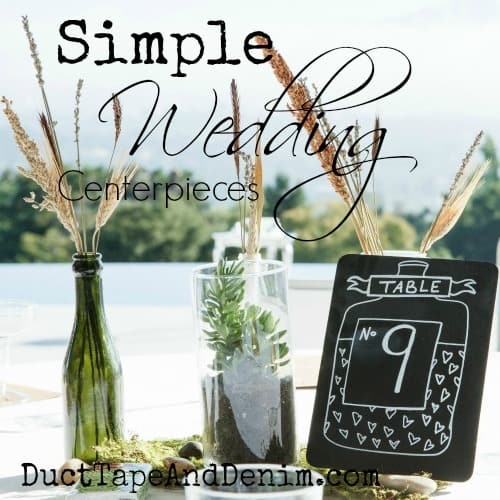 If you enjoyed seeing our DIY wedding centerpieces, check out all our other DIY wedding projects. 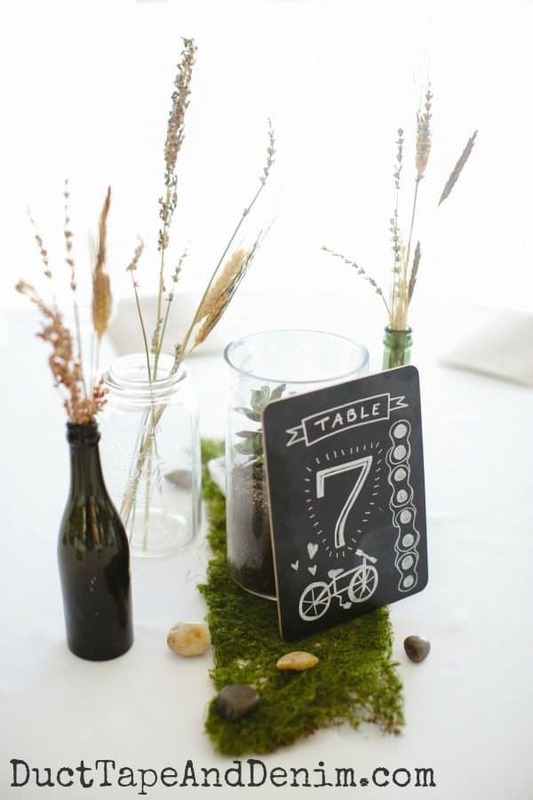 And don’t forget to follow my DIY Weddings board on Pinterest! 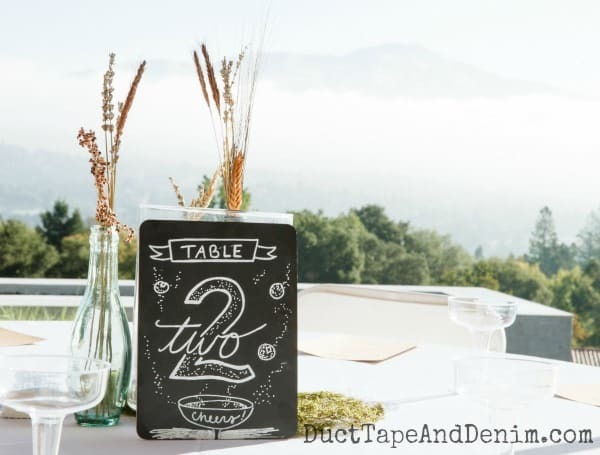 Follow Ann @ Duct Tape and Denim’s board DIY | Weddings on Pinterest. 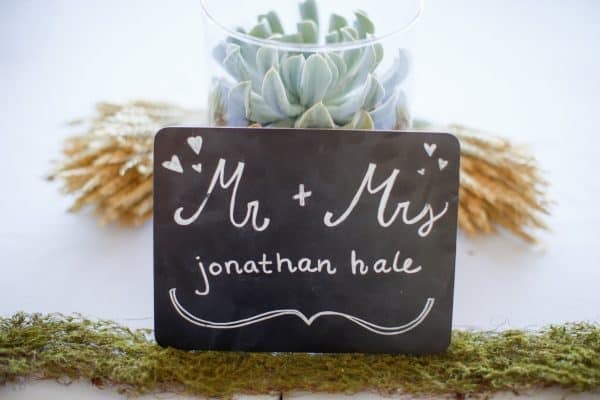 Photos from the day of the wedding by Jana Melinda Photography. All other photos were taken by me with my iPhone!